A walking path at D.T. Fleming Arboretum. D.T. Fleming was considered an extraordinary man with vision. Among his many accomplishments, he is credited with saving the cattle industry in Hawaii. An introduced ornamental plant called white loosestrife or pamakani meaning “windblown” quickly spread to all the islands and was making cattle and horses sick. Introduced species sometimes wreak havoc in Hawaii – like the mongoose or Axis deer. Cattle would eat pamakani, lose their hair and get sunburned. Horses would eat it and develop colic. 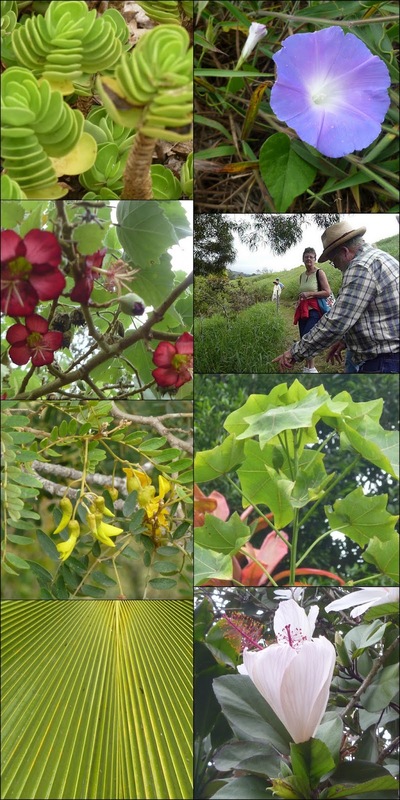 As a ranch manager trained in watershed management and a lifelong student of botany, Fleming often traveled, looking for plants that would be beneficial to Hawaii. He encountered a gall fly that fed on pamakani, got permission to bring it to Hawaii, and almost overnight, it practically eradicated pamakani. This is a rare happy ending for an invasive species nightmare. In gratitude, the Baldwin family, a major landowner, gave him 17 prime acres towards his dream: to create an arboretum to preserve native plant species on Maui, ultimately hoping to restore South Maui’s watershed. This became D.T. Fleming Arboretum. I believe these are hau flowers (pronounced "how") which change color from yellow to rose as they age. Most people associate D.T. 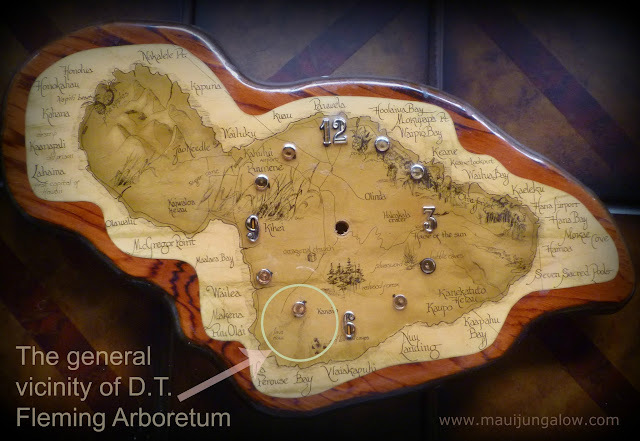 Fleming not with the arboretum but with D.T. Fleming Beach on the West Side of Maui. It’s considered one of America’s finest beaches, but like New Yorkers who have never visited the Statue of Liberty, I have never been there. Baldwin Beach is much closer to my house. Reading about D.T. Fleming is so inspiring – he pushed for affordable home prices, learned fluent Hawaiian, reforested drought-stricken areas, I’ll have to visit his other namesake, but not this month! Unlike D.T. Fleming Beach Park, D.T. Fleming Arboretum is a hidden gem, tucked in far off Ulupalakua and set amid two craters. It offers exquisite views of the South Shore including La Perouse Bay and Ahihi-Kinau. Many rare Hawaiian plant native species can be found at D.T. Fleming Arboretum. The arboretum offers guided tours and volunteer projects year-round. I had the good fortune to take a tour with Bob Hobdy, a venerated Maui plant and cultural expert. There was so much information that Bob shared with us – this was before I started blogging – I took a lot of videos of Bob talking. This was BEFORE I learned that you can not move the video camera as fast as the eye can see – you must move the camera VERY SLOWLY and SMOOTHLY or else it will make the viewer quite seasick. I told Martha, the granddaughter of D.T. Fleming, that I would give her the videos for the arboretum – but haven’t had the time to edit the videos. So another thing for my to-do list – dropbox her the videos in their hideous raw state, or find a volunteer video editor. This is a vintage Maui map on a clock at my home. With the hands removed, it's easier to read place names. D.T. Fleming is located in the hills facing Ahihi-Kinau, including La Perouse Bay.